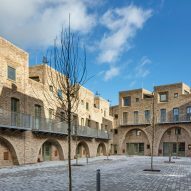 Peter Barber Architects has arranged a block of 26 shared-ownership homes around a central courtyard in Stratford, London. 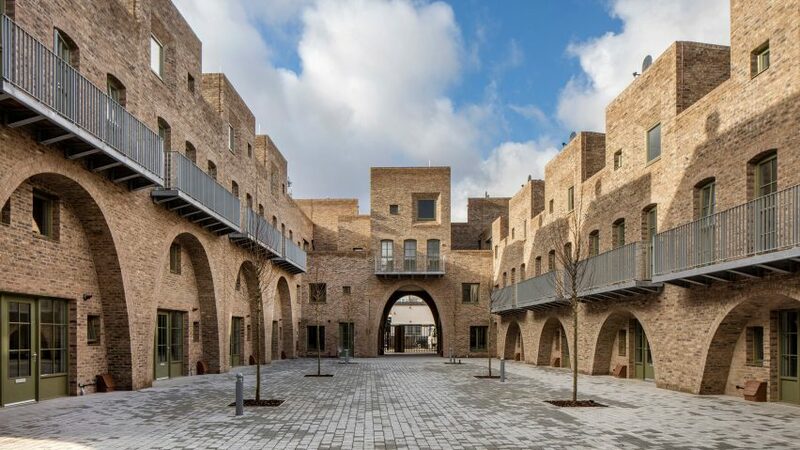 The block on McGrath Road for the London Borough of Newham, is a reinterpretation of the Victorian back-to-back housing typology popular in England's rapidly expanding industrial cities during the early 20th century. 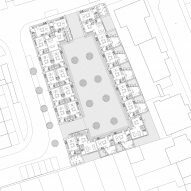 Peter Barber Architects' housing at McGrath Road seeks to utilise the density provided by back-to-backs, which were were squeezed in tightly, with single-aspect spaces, no gardens and few windows, but vastly improve the standard of both indoor and outdoor space. "In my view the type had a great many benefits," explained director Peter Barber. "They were cheap to build and therefore relatively inexpensive to rent, and were arranged along streets and in courts which assisted in creating the potential for neighbourliness." Only the western block uses a back-to-back plan, with units arranged symmetrically against one another but stacked to allow for dual-aspect openings. 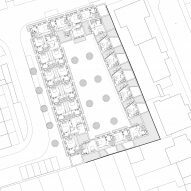 Opposite, the slimmer eastern block consists of a single run of homes, and together the two blocks surround a central planted courtyard. The block's northern and western elevations curve around the street corner, with a facade articulated by deep, arched brick reveals that frame windows and a door into each home and provide a covered, semi-private space. "I am fascinated by the relationship between people's houses and the street", Barber told Dezeen. "Our deep frontages are there so that if people feel like it they can do stuff at the pavement edge: lock their bike up, stick some flowers out, find a spot to sit out or have a barbecue." 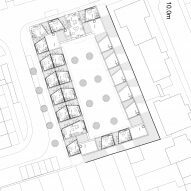 The notched roofline of the block articulates individual homes, and provides each with a small roof terrace. 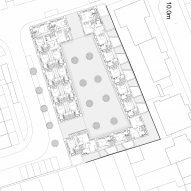 "They mean the building heights are 3.5 storeys and 2.5 storeys, which felt about right in relation to our neighbours, the street, and the central square", explained Barber. 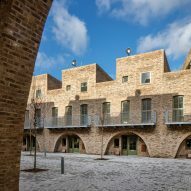 Two of the elevations' arches form entrances into the courtyard, where facades have been given the same treatment of recessed arches, with balconies above overlooking the central space. "Our central square feels a bit European but is also reminiscent of courts in medieval London and in some early 19th century worker housing", Barber told Dezeen. 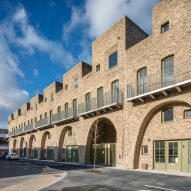 "More references would be pre-war model housing in London, notably Peabody Estates, often entered through an arch." 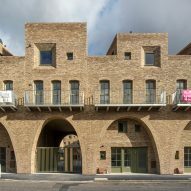 A similar method of using recessed arches featured in a previous scheme by the practice in Stratford. The practice has also recently completed a mews housing scheme in North London, and recently spoke to Dezeen about the project One Year 365 cities, for which Barber is designing one city a day.